The first violin part for Elgar's Enigma Variations, Op. 36 has been edited by Ilya Kaler, who has appeared as guest concertmaster with the San Francisco Symphony, Philadelphia Orchestra and Baltimore Symphony. Kaler's bowings, fingerings and other editorial markings have been added throughout the score. Edward Elgar's Enigma Variations is an orchestral work comprising fourteen variations on an original theme. Composed between October 1898 and February 1899, each variation is a musical sketch of one of his circle of close acquaintances, including his wife Alice (variation 1) and his friend and publisher Augustus J. Jaeger (variation 9). The word ‘Enigma’ was confirmed as the name of the primary theme in Elgar's 1911 programme note. This opening G minor theme displays unusual melodic contours, perhaps symbolizing introspection as Elgar personally identified himself with this theme. The Enigma Variations achieved immediate popularity after its 1899 London premiere and established Elgar's international reputation. 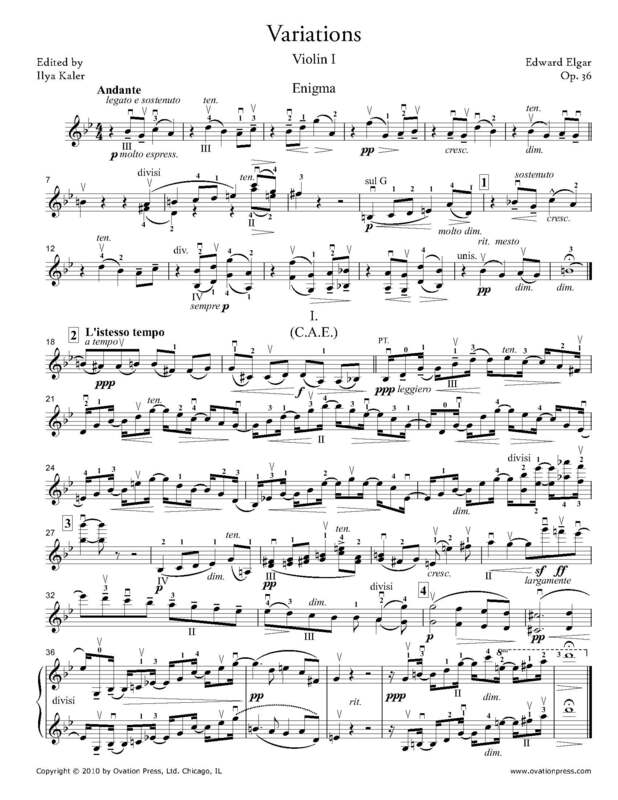 Download and print the score today to gain access to expertly edited Elgar Enigma Variations violin fingerings and bowings from Ilya Kaler!